Whoever got people started using the phrase “steal shamelessly” in regards to lean ideas and practices should be ashamed. I am quietly offended when people say this to me because it shows a certain lack of respect for the act of teaching. I am sure that most people do not mean this in a malicious way, or to deprive others wrongfully by their act of stealing. But we should be careful in the words we use, as they do condition our mindsets and therefore our behaviors. 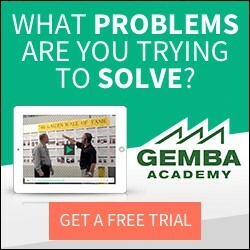 We at Gemba are strong believers in the power of sharing, and that giving creates wealth. Another benefit of giving is that it prevents stealing. You can’t steal what is shared freely. I would like to express my thanks to all of the readers who visit this blog and contribute their comments and share their experiences, thereby helping to keep this a lively place for discussion. In particular a few kind readers and friends who have recently sent articles or ideas to post on this blog have helped to keep the conversation going while I have fallen behind. Ron Pereira’s takt time calculation contest has generated some interesting discussion, and I encourage you to add your thoughts or comments. To commenters who post their responses and ideas between now and May 1, we will happily award another two copies (for a total of four) of The Illustrated Toyota Production System, at random. The takt time calculation part of the discussion has already been largely addressed in the comments section, but there are other issues we can explore related to Ron’s challenge. I would like to make a correction to the article about Marathon Coach and their many brilliant kaizen ideas using tennis balls. I stated that these were Chris Carson’s kaizen ideas, but he clarified that the credit is due not to him but to the strong buy-in for kaizen that exists from the leadership at Marathon Coach, and to the high level of involvement from across the organization. Following your blog about tennis balls, we had a suggestion yesterday regarding the use of golf balls. A particularly difficult problem was solved very simply and quickly using two golf balls to separate o ring seals in a bowl feeder. Our Engineering Dept had developed a fantastic automatic assembly machine for the assembly of toner bottle shutters. This machine eliminated a very difficult manual process and gave almost perfect quality. Unfortunately its downfall was feeding o rings which stuck together in the feeder mechanism. This problem caused constant operator intervention and line stops to clear jam ups. Our Engineers pondered long and hard to come up with a solution most of their solutions involved robots, high expense and asking our o ring supplier to change his standard process. The operator, who had to continuously fix the jam up problem or ensure every single o ring was separated by hand before tipping them into the bowl feeder, came up with the idea of placing two golf balls in the bowl. So far this has eliminated to jamming problem see pictures attached. 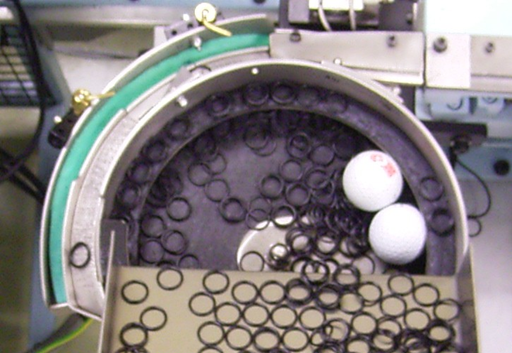 On the lower left side of this picture there is an O ring bowl feeder, to which this “golf ball kaizen” has been applied. Simple but brilliant kaizen ideas. Thanks for sharing, everybody. I agree, stealing is wrong. And when people say stealing shamelessly when they actually mean learning and applying it is a very poor choice of words. We should encourage people to learn and apply what they learn. When you talk about it as stealing I think you undermine what you should be trying to create. Still I often just accept this wording because I get worn down by how often it is used. Maybe you could turn it around and talk about “sharing shamelessly”? I use the phrase “Steal This Idea” on my blog when I post an improvement idea I think people could benefit from copying. The choice of wording was deliberate, but doesn’t mean anything negative. There is also the matter of those who use something without permission or credit. Just because I see my neighbor’s grill outside does not mean I can take it home and use it. I should ask him first unless he puts a sign on it that says “FREE GRILL” or something. This idea about golf balls separating the O-rings is great! We have struggled forever with baby powder on rubber components to keep them from sticking, which contaminates the equipment pretty badly, causing other problems. I think we need to try the golf ball idea. Thank you for sharing it. I thought I was crazy when I agreed to use some rubber stoppers in our vibratory bowl feeder to help separate parts!! I took the same route for trying to resolve the issue, automation/electromechanical devices to help separate the parts to allow just 1 part to fall at the end of the bowl!! Chris–we implemented the idea for one trial application last week and it is working great! Thanks for the idea!